AMBOY – Just in time for the holidays, local artist, Anna Perun, returns to the Amboy 4-H Environmental Education Center to demonstrate and teach the ancient Ukrainian art form of pysanky, in which traditional folk designs are written on eggs with hot beeswax while dipping the eggs in various dyes. Anna Perun demonstrates writing with beeswax to a participant this spring. On December 13 at 2 p.m. as part of the 2015 Nature Inspires series, participants will create holiday-themed eggs, for although pysanky is very popular around Easter time, these beautiful eggs are often given as precious gifts and make unique tree ornaments. Perun discovered Pysanky and the tools used to make them in a small Ukrainian shop and shortly thereafter decided to honor her Ukrainian heritage by teaching herself the ancient art form of Ukrainian egg decorating, and learning the traditional motifs and their ancient significance. Perun began creating her own Pysanky in 1994, a few years after arriving in the United States from Ukraine. 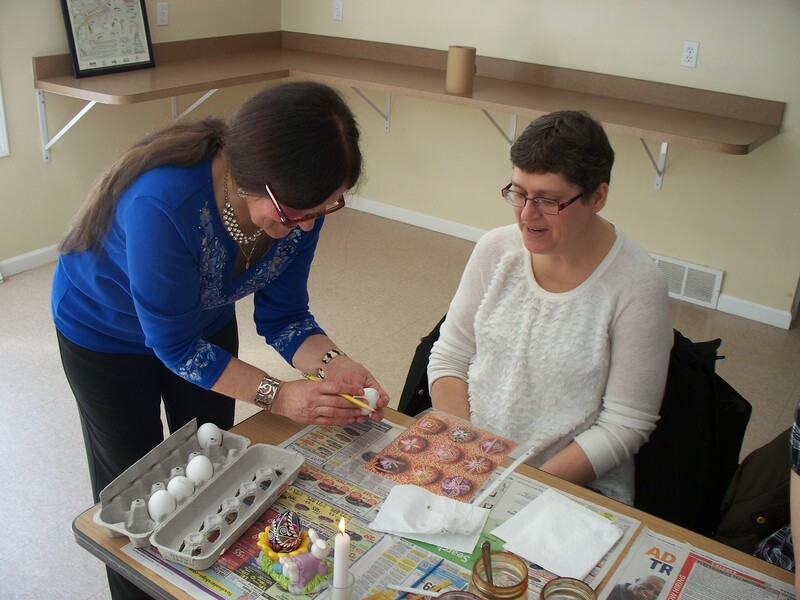 Pysanky: Ukrainian Egg Decorating is being held at the Amboy 4-H Environmental Education Center located on State Route 183 in eastern Oswego County. Advance registration, which is $11 ($4 per person plus $7 for supplies), is required since seating is limited and program materials are being supplied. To register, please contact Cornell Cooperative Extension of Oswego County 4-H Program at 963-7286. Nature Inspires is made possible with funds from the Decentralization Program, a regrant program of the New York State Council on the Arts with the support of Governor Andrew Cuomo and the New York Legislature and administered by CNY Arts.